Thailand is mostly self reliant on it's production of energy. Electricity is generated using it's own natural resources such as coal and a recently tapped supply of natural gas from the Gulf of Thailand. There were attempts to set up an experimental nuclear reactor but I think that this project has been largely abandoned. Some electricity is supplied from neighbouring Laos in the north. A change to the statement about nuclear power in Thailand. Now (2007) the idea has been dusted off and it appears serious proposals and plans are underway to build not only one nuclear power plant in Thailand but a whole series of them. There are of course serious concerns too. Thailand does not have an available supply of nuclear technicians or even nuclear scientists. There are only a handful of main energy companies. They produce power primarily through coal and oil/gas powered generators. A list of these primary energy producers can be found below. Small, usually experimental, projects have been set up to try out alternative energy producing methods. Thailand is not blessed with high mountains and fast flowing rivers so the use of hydro technology to generate electricity is limited. Winds are not consistently strong enough to warrant wind turbines being erected. The main area of interest particularly in rural areas is the use of bio-mass technology. There are some pilot projects underway and they seem to be showing promise. 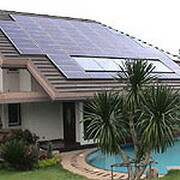 One may expect solar power to be a valid option in a tropical climate. However although the climate may be hot the skies are not always blue. Furthermore most of the alternative forms of energy production require a high capital outlay. The Thai Government, Khun Taksin (a self confessed and proven technophile) has mooted that more emphasis should be placed on pursuing alternative energy methods. As yet this seems to be a lot of hot air and political rhetoric to satisfy the ears of global environmentalists. Well the prime minister Taksin Shinawat has gone but the hot air emitting from the global environmentalists still pollute the air more than a fleet of Bangkok Buses. Thank goodness more hot air was avoided by the cancellation of a planned visit by Al Gore. Apparently the Thai environmentalists couldn't come up with a reputed 100,000$ fee. Nevertheless the great Global Warming Scam is starting to show it's ugly face in Thailand and serving to scare the general Thai population who know no better. As with most industrial machinery and equipment most of the electricity generating equipment needs to be imported. Large European companies seem to have this corner of the market well sown. There are opportunities however for other importers and distributors to supply secondary equipment for these energy producing plants such as air conditioning equipment, air filters and insulation products. ABB Limited Thailand Distributor of Engineering Supplies, Electrical Power Machinery, Switchgear Equipment For Distributing Electricity. Suppliers of motors, drives, boilers, furnaces, industrial power plants, industrial robotics and related products. Activities Produce and services include: gas turbine and combines cycle power plants, utility steam power plants, hydro and nuclear power plants and environmental system.